This little thing is my new best friend when making deviled eggs. Works better than I ever imagined. And it doesn't destroy the egg. beware, you can shake it too roughly and it will destroy your egg, so remember to go gently. After continuously fighting with trying to peel hard boiled eggs, I figured what the heck...I gotta try this. Although it seemed a little pricey, I ordered. I must report that my wife and I immediately boiled up a half dozen eggs to try this out and all I can say is WOW! This little contraption is amazing! No more arguing over who "has" to peel the eggs...from now on it will be a battle as to who "gets" to peel....thank you! I used it this morning for the first time and it was amazing! I definitely recommend it. I have never in my life, and I’m 55, EVER cooked and peeled a dozen perfect eggs until the Negg came into my life. I used to hate to peel eggs, now it’s fun and it’s fast. This little gadget really works. I kept looking at it wondering! Then I decided to order and am glad I did! I Got this a while back...ended up in a cupboard. Made a dozen hard boiled eggs and ruined them all due to terrible peeling. Remembered that I had this, go it out and used on another dozen. Every single one was perfect. The shells literally fell off. Awesome product. Love this thing! Just make sure you are "peeling" the eggs while they are still slightly warm. You have to get this!!! I have this product, and love it. It is so easy and fun. I am happy that I own it. This is the easiest way to peel an egg. The peeler works flawlessly every time. So simple and so reliable. 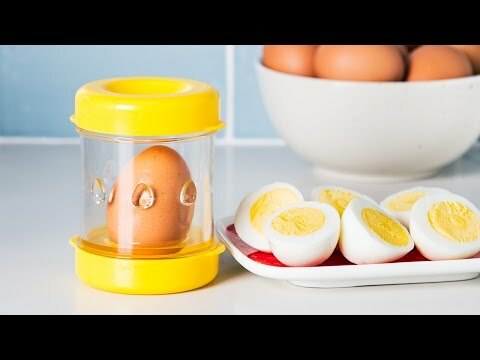 If you don't have one of these and like boiled eggs, you need to invest in one soon. 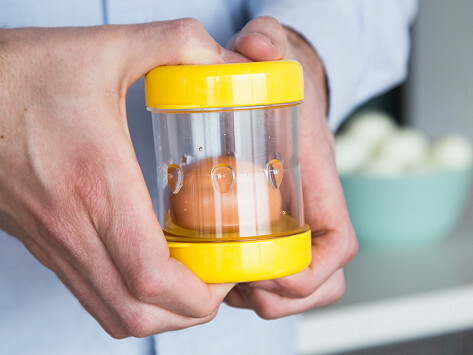 Peel an egg without pulling your hair out. Cold water and some shaking is all it takes for this hardboiled egg peeler to work. It’s a Made in the USA kitchen hero that conquers a dreaded chore sleekly. Maker Bonnie Tyler signed up to bring deviled eggs to a party and—after a failed attempt at peeling—showed up with a bag of potato chips instead. After some prototyping and research at her local library, she cracked a solution. Bonnie combined the elements of industrial peeling (i.e., vibration, movement, and water) to create something small, portable, and easy to use at home. That’s how The Negg was hatched. She even managed to get it manufactured in Connecticut, her own backyard.